The deadline to submit your nomination for the National Board of Directors and each of the FEWA 2019 Chapter Board of Directors is quickly approaching. Members are invited to nominate themselves or nominate a fellow current member. Nominations for the National Board of Directors can be sent to the National Office by Wednesday, December 5. Serving on the Board is a great way to expand your network, advance your knowledge, and give back to the FEWA community. The FEWA e-newsletter is distributed twice a month, giving members plenty of opportunities to contribute an article, news item, or event notice for our newsletter! 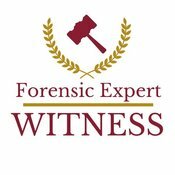 We are always interested to hear about your experiences as an expert witness and/or legal consultant, whether you are just starting out your career or are a seasoned expert. Click below for more information about how to create and submit an editorial piece to FEWA. The value of your membership has increased! Continue your commitment to FEWA and renew your membership for 2019 to maintain your FEWA benefits. 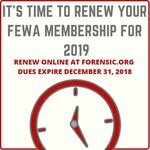 We made it easy to renew your FEWA membership online. Follow the link below for information about FEWA Membership Benefits and a how-to guide to renewing your dues online. Click here to renew your membership dues before they expire on December 31! Register TODAY for the FEWA 2019 National Conference! Registration for the FEWA 2019 National Conference is OPEN! Reserve your spot today for the most anticipated event of the year for Forensic Experts, April 26-27, 2019. Join attorneys, your fellow experts, and other legal professionals at the Bar Association of San Francisco for two days of learning, mentorship, networking, and earning CFLC credits. Click here to register. For more information about the FEWA Conference visit the link below. The National Forensic Science Commission was dissolved last year by the Trump administration. A handful of states including Texas and New York have their own commissions tasked with functioning as gatekeepers of the evidence and testimony in their own jurisdictions. Wisconsin could join this list. Is forensic science “under attack?” Deputy Attorney General Rod Rosenstein said so in a speech at the National Symposium on Forensic Science back in August. But a new paper by the immediate past president of the American Academy of Forensic Sciences in Forensic Science International asserts that challenging “routine” forensic methods should be done constantly, to get at the right answers. Challenges are not “attacks,” it adds. In the hands of crime investigators, a drone can reveal a range of personal and financial information about its owner. As forensic and material technology rapidly advances, art authentication keeps improving - but so do the forgers. Experts in the field share how a fake is spotted and how a genuine piece is authenticated. Current CFLC Certificants due for renewal should submit their Recertification Application and required CFLC Exam by the December 31, 2018 deadline. 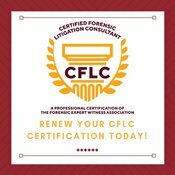 As of November 1, any new or renewing Certified Forensic Litigation Consultant (CFLC) certificant is required to pass a 60 question online exam, in addition to meeting the minimum requirements of participation and coursework. Those due to recertify by December 31, 2018 can find detailed information about the renewal requirements here. Please contact the FEWA National Office with any questions.